Handling the "I" in "Origination"
When rainmakers focus only on their own business origination and client service, the idea is lost that clients belong to the firm, not to a partner. Firms that service major clients with teams (not just a single rainmaker) can cross-sell between teams according to a strategic plan, and can give clients a complete and virtually seamless service package. Client billing is simplified, and bonuses can go to those teams that get results. Steps like these institutionalize client billing, profitability and compensation. The firm doesn't face sudden disaster when rainmaker partners leave or retire - and clients are better served. If clients place primary reliance on the firm, individual lawyers are the beneficiaries as the firm itself maintains relationships and generates new ones. When the marketing function promotes the law firm, even if a lawyer with special skills is the "product" sold, it will most often be the law firm as an institution that will be seen as the service provider in the attorney-client relationship. Nothing is more important to the future of law firms than removing the issue of who actually serves the client from the individual context alone, and placing it at the heart of the service dynamic. 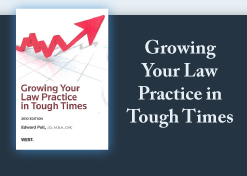 Lawyers often want legal services to be seen as unique because of the attorney-client relationship or because of the special skill required to deal with the challenge or because the client has some constraint that only a few lawyers can accept. Yet, a service approach that emphasizes the firm's entire range of capabilities and value-added resources is the best way both to serve clients and to create a more profitable firm from which all firm members benefit. To use a sports metaphor, athletic teams that have one or two self-centered, freelancing stars may have a good season (often followed by a collapse), while teams with no stars, but great cooperative skills typically stay at the top longer. I've just talked with two legal industry "executive search" recruiters. They have never been busier in the last 5 years! That tells me that the economy is in recovery mode; that lateral partners are still being pruned from large law firms; that partners are getting tired of the politics in larger law firms where they see no rational basis for decisions being formed that may very well impact their economic future; and that most law firms have yet to act as enterprises rather than as hotels for sole practitioners. This further suggests that while the economy has forced changes in law firms, the sea change some discuss hasn't yet taken place... and may never. As I've said before, we're in an evolutionary, not revolutionary, mode. Write me with your thoughts and experiences on this.